Ty Sanders thought that looking for his brother's long-lost daughter was a fool's errand. That was before he stumbled upon a tough-as-nails young woman battling desperadoes to protect the kid. Now all Ty wants is for Jenny to hand over his niece. But Jenny Jones has a suspicious nature and a promise to keep. Plus her word is all she has-until a little runt of a girl softens her defenses...and a rugged cowboy steals her heart when she isn't looking. 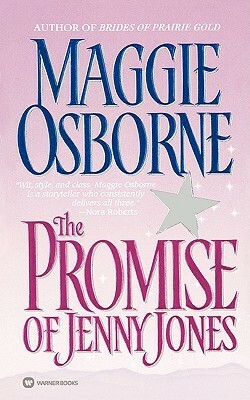 The Promise of Jenny Jones by Maggie Osborne won the 1998 Romance Writers of America award for best long historical romance. I have wanted to read a book by this author for some time as I have heard other readers recommend her. This book is a western and I don't think I have ever read a book that could qualify better in this genre. It was unmistakably western and I loved it. Jenny is a tough character, she has had to take on responsibility early and from the age of ten when when she was thrown out of her own home, she is used to fending for herself. When she takes on the care of Graciela a six year old, she expects her to learn to take care of herself too. A little bit of a tussle there, because Graciela is used to being pampered. However with Jenny to guide her Graciela grows into someone beautiful and amazing. Ty Sanders, the uncle of Graciela is determined to take on the care of Graciela and return her to her father, yet they soon find that it is going to take the both of them all the skill and ability they have to see Graciela safely home. Her money hungry cousins are out to grab Graciela and 'do away' with her. I lost count of the gun fights, fist fights and injuries! Needless to say Jenny and Ty manage to come out winners, although the last battle is not all they had wanted. I loved all through this their growing appreciation of each other and how they became attached to Graciela. I have to say for the last fifty or so pages I sat with the tissues, it was poignant, bittersweet and so perfect. A western romance that I thoroughly enjoyed. I loved this book too - a little surprising since it takes a while for Ty and Jenny to get "on page" together. And you are so right about the last several pages. The relationship between Jenny and Graciela especially had me tearing up. Exactly, wasn't it beautiful, considering it didn't start out that well! Historical Western sounds good to me. Sounds like a sweet one. Naida, this was very good. It was sweet but very gutsy as well.